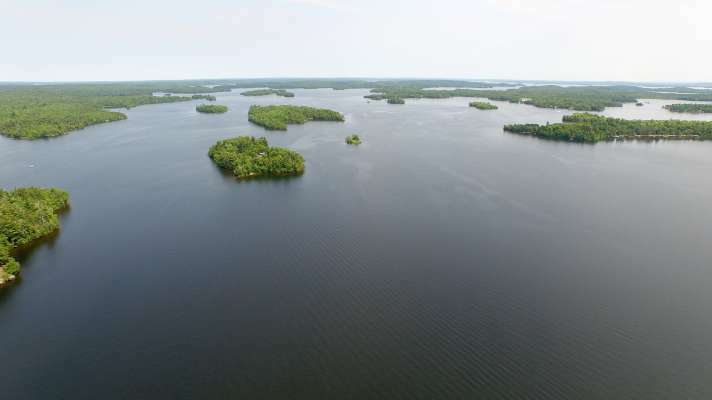 Named after its exquisite inhabitants, which nest high in surrounding trees and can often be seen circling offshore waters, Eagle Island offers 5.5 acres of vivid landscape on one of the few privately held, single-owner islands in Lake Vermilion. Located between Frazer Bay and Black Duck Bay about a half mile from the lake’s north shore, Eagle Island is only a five-minute boat ride from the mainland yet completely envelops you in nature. The 4,570-square-feet, four-level house draws inspiration from natural materials and was the collaboration of nationally recognized architects, builders, and craftspeople including Sharatt Design & Company, Johnston Masonry and Firelight Galleries, among others. Architectural highlights include the main lodge’s construction from Montana spruce log, wings built from a contemporary steel frame with soaring insulated windows for eye-catching views in every direction, and an electric-powered, vintage-inspired elevator that provides easy access to every floor. Ample living space and plenty of amenities for entertaining are found in the three-bedroom, five-bath home. From the foyer’s hand-stained concrete floor to the reclaimed wide-plank wood and hand-knotted Egyptian rugs throughout the main level, the attention to detail is evident. Home cooks will feast on the kitchen’s design, which features a Thermador five-burner gas cooktop and wall-mount oven, built-in Sub-Zero French door refrigerator, and walk-in pantry. At evening’s end, the spacious master bedroom is the ideal place to curl up with a good book or appreciate the natural surroundings through its floor-to-ceiling windows. An observation deck provides outdoor lounge space among the treetops. With two private docks and an inclusive condominium membership with indoor watercraft storage at nearby Shamrock Landing Marina, life on Eagle Island is as convenient as it is majestic. Nearby activities include bountiful fishing for walleye and northern pike, golf at The Wilderness at Fortune Bay, state trails, and even geocaching, the GPS-driven treasure hunt. But the real treasure is calling Eagle Island home.